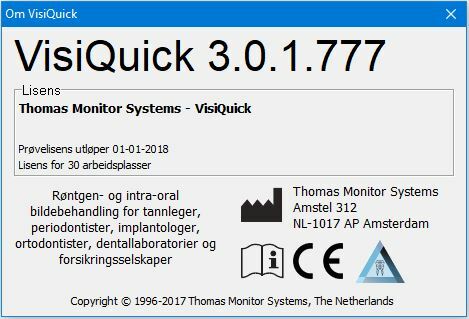 VisiQuick version 3.0.1.777 is CE certified. This complies with European regulations for (x-ray) image processing programs. This obligation applies to all image processing programs and not just only VisiQuick. You can see in the help screen of your program whether it is CE certified or not. If you do not see a CE logo then contact us to inform you for upgrading or transfer to VisiQuick. All customers with an active (non-expired) license can use as usual the latest version. For customers with no longer active (expired) licenses and new customers, an action has been initiated to start working with VisiQuick CE. With this action VisiQuick becomes by far the cheapest program for (x-ray) image processing software. VisiQuick: Most Used, Highest Rated, Fast and Safe! Please respond here through our contact form.